Breathwork 101 | Can A Breathing Practice Change Your Life? It’s hard to imagine that something as simple as breathing changed my life, but that’s exactly what happened this past year. Now, I’m not talking about just the act of breathing (though if that were to suddenly cease, that would obviously be life changing as well.) I’m talking about my discovery of Breathwork – a healing modality that has helped me release layers of grief and pain while connecting me deeper to my intuition and inner trust. As an acupuncturist and Reiki practitioner, I had worked with energy (both my own and my clients’) for years. I thought I knew what it felt like when energy moved in my body. That’s why, when my body started buzzing and vibrating along specific acupuncture channels during my first Breathwork session, I was blown away by the sheer intensity of the sensation. This wasn’t anything like the sensation of “da qi” (obtaining energy) that I had experienced during even my most dynamic acupuncture sessions as a patient. Never before had I experienced energy move through my body in such a powerful and specific way. Breathwork, is an all encompassing term for a controlled breathing practice. There are a variety of styles that are taught and practiced, and I have been trained by my teachers Erin Telford and David Elliot. This style of Breathwork is a type of three-part active breathing that is incredibly simple. You start by breathing deeply into your belly through your mouth, then up into your chest (again through the mouth), and finally release the breath (once again, from the mouth). The purpose is to stir up the emotional center of the body (the second and third chakras), bring that energy up to the heart center (heart chakra) to wash it with love and help release stuck grief, and then release the energy through the mouth. Focused breathing has long been a huge part health and wellness (ex: yoga and meditation). But whereas the intention of focused breathing in meditation is often used to help manage stress, lower blood pressure, and calm the nerves of the person practicing, the intention of this style of Breathwork is to (sometimes forcefully) break up stagnant energy in the body and release it. Relaxing is probably the last word I’d ever use to describe this type of Breathwork! Energizing, cathartic, cleansing, connecting, powerful, healing, purgative – now those are words I’d use! My first Breathwork experience was a few years ago now. It was so profound for me that I ended up training in it so I could bring this powerful medicine to my acupuncture and coaching clients. It has since completely changed the trajectory of my business. As a direct result of my first experience, I ended up imagining, creating, launching my most ambitious offering to date. A launch that brought in over nine thousand dollars to my business! Well, one of the things that I’ve found Breathwork is amazing for, is helping me better connect to my intuition and guides. Every time I practice Breathwork, I end my session with lots of messages, visions, and a deep knowing of what direction I should go in my life or business. It’s like a map of what road to take next and what choice will yield the result that’s for my best and highest good. For me, deepening my connection to my Breathwork practice has directly correlated to a deepening of my intuition. 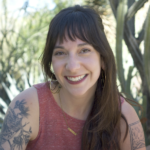 At the end of that first Breathwork experience, I had a vision of myself leading a wellness retreat of women bosses in Joshua Tree, CA – and just a few months later I had sold out my very first retreat! Strengthening the intuitive muscle isn’t the only benefit of Breathwork. I’ve found that it’s also exceptionally useful for working through grief, relieving pain (both emotional and physical), healing past trauma, deepening spirituality, moving through a crossroads in life with more grace and ease, releasing limiting beliefs, and boosting creativity or removing creative blocks. I’ve seen some amazing things happen to my clients through Breathwork. One client was able to feel connected to her body for the first time in over twenty years after surviving abuse as a child. Another client had a radical realization relating to her sexuality after our first Breathwork session that changed her entire life. I’ve seen clients experience sacred closure after losing a loved one or ending a pregnancy. I’ve even witnessed a client find the home of her dreams two days after our first Breathwork session (which focused on that topic!) after looking on the market for over a year. Saying I’ve seen some amazing things might actually be an understatement. While all of the experiences above happened after private one-on-one healing sessions, that’s not the only way to experience and benefit from Breathwork. I’ve found that even short sessions of twelve minutes per day can create subtle, gentle shifts that accumulate over time. I’m so convinced that anyone (and everyone!) can benefit from this shorter form of Breathwork that I’ve even created a free 7-day Breathwork challenge for anyone to try. You can learn more about it here. Amy Kuretsky is a wellness coach for mind, body, and business. As a creative entrepreneur herself, she doesn’t think that you have to choose between your health and your hustle. Her work is focused on helping female-identified business owners heal what needs healing - whether that’s their anxiety and limiting beliefs one day or their business model the next. When she’s not coaching creative business owners she’s running a busy Chinese medicine clinic in Minneapolis, leading wellness retreats around the country, and getting woo-woo AF.